Let’s face it: cannabis products are more expensive these days. But, then again, what isn’t? If you need MMJ daily or have a high tolerance like me, every dispensary trip ends in spending a serious chunk of change. Being on a budget, I’m always looking for affordable and effective products that won’t break the bank. Sadly, with many of these, the trade-off for a reasonable price is a lack of quality. 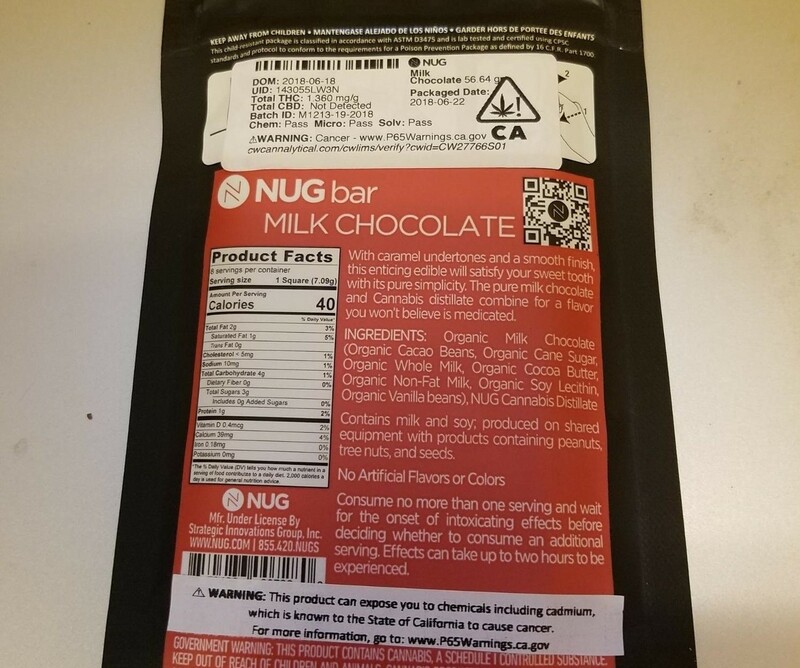 But sometimes I get lucky and find a quality, affordable edible that uses organic ingredients like NUG’s 80mg Milk Chocolate Bar. Did I find the Golden Ticket? Keep reading this comprehensive review to find out! The generic packaging leaves a bit to be desired. This cannabis milk chocolate bar comes in a matte black, child-resistant, resealable bag with large red stickers on either side. Besides this bright red color, the labeling doesn’t jump out. When I opened it I expected to see a box, or at least foil wrapping, but was disappointed to find no protective layer between the bar and the bag. Only bare chocolate, broken from a lack of protective packaging. Willy Wonka would never have accepted these standards–but he also scarred children for life with his hellish boat ride. You win some, you lose some. As far as labeling, NUG provides all the information required by California Adult-Use law, though it’s aesthetically boring. It’s like the lentil soup of cannabis; so good, but you’d never know by looking at it! The back lists the organic ingredients, nutritional facts, a brief description of the product, dosing instructions and lab test results. Yet these results show the THC content actually falls a few milligrams short of the advertised 80mg to 77.03mg, contradicting the front label. I wish the labeling included the strain(s) used or at least an indication of cannabis type–indica, sativa, or hybrid–so I know what to expect. “Excuse me, is this car a manual or automatic?” “Who cares?! Just drive!” Makes total sense, right? The chocolate bar looks like a type one, only divided into eight demarcated pieces with 10mg of THC, though each actually has 9.63mg. All are stamped with either the NUG name or logo so you know these aren’t typical chocolates, a crucial component considering there’s no inner packaging. As soon as I sink my teeth into a piece of NUG’s milk chocolate, I can instantly tell it’s made from quality ingredients. The brown treat is dense, velvety, and has a subtle caramel note making it more interesting than the average chocolate edible. It’s full of organic ingredients like cane sugar, whole milk, 39% cacao beans, cocoa butter, non-fat milk, soy lecithin and vanilla beans, not to mention ethically grown, pure cannabis distillate. No artificial flavors or colors. The lower than average total THC content (typically 100mg) and the standard 10mg pieces are a good dose if you’re an edible newbie and/or have a low to moderate tolerance. They’re filling, so if you require more milligrams try a smaller and lighter edible like Kushy Punch’s 100mg gummy for a couple more bucks. Or pig out on the candy bar. It’s your life. I’m not your mom. YOLO! Affordability is where this NUG milk bar really shines. At just about $10 for 80mg of THC, it’s a great deal–even if mine lacks about 3mg. It’ll be hard to find a higher quality edible for the same low price. Because of this affordability, I can look past the lackluster packaging and cleanly broken pieces. As the saying goes, “cheap things come in dull packages” (that’s not a real thing people say). This infused chocolate bar provided a mellow mood with relaxing properties, though didn’t make me nearly as hungry as I assumed it would; maybe because it’s a bit heavy. In fact, I couldn’t finish my dinner (which may or may not have been lentil soup). However, I was able to have a lucid conversation with a friend and it helped my digestion. I’d appreciate these pleasant, mild effects on my next camping trip. It’d be more fun than using a Hershey bar to make s’mores with friends around a crackling fire. Packaged in a generic, child-resistant, zip-bag with branded stickers on both sides. No box or foil wrapping around the chocolate. Broken pieces due to a lack of protective packaging. Just enough for adult-use compliance and a bit more. Lacks visual appeal; lab results on the back contradict the frontside. I would have liked to see some info about the strains used, maybe an indica, sativa or hybrid classification. Dosage isn’t exactly 10mg and requires some calculation. Indented to make eight 10mg (actually 9.63mg) pieces, but separating those into anything smaller is tricky. Without any foil to conceal this edible, carrying it in the black and red bag might raise an eyebrow. Could be re-bagged, just make sure nobody sees the word NUG stamped on the chocolate. Tastes like your average milk chocolate bar; no cannabis taste. Nothing spectacular–if you enjoy straight milk chocolate, you’ll like this bar. Exactly as it should be, smooth chocolate that melts in your mouth. Nothing granular; no residue left behind. Provided a mellow mood with relaxing and sedative properties. Didn’t make me nearly as hungry as I thought it would and I couldn’t quite finish my dinner. Helped me digest my meal and I was able to have a lucid conversation with a friend. A good choice if you want to stay clear-headed but enjoy a chill buzz. A solid milk chocolate bar that can be melted down into any recipe that calls for chocolate. Use it in frosting, a cake, hot chocolate–the sky’s the limit. Pieces can be broken into “chips” and used in cookies, trail mix or a topping for ice cream or yogurt. While the chocolate will always taste the same, the THC content might not be as high as you think. You might open the package to find your chocolate bar in pieces. At $10, this is a good deal for a chocolate bar with 80mg of THC. If the packaging was better and the labeling was more thorough and consistent, this would have earned a five. 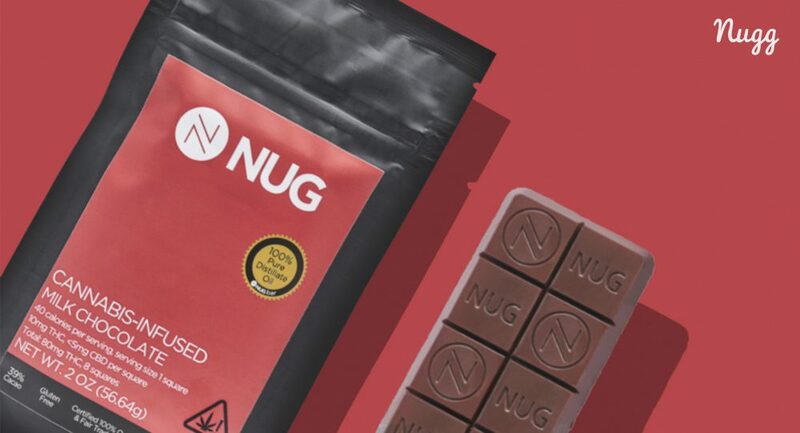 While the packaging is bland and weak, NUG’s 80mg Milk Chocolate Bar is an affordable, no-frills, edible that’ll give you a chill buzz and keep you clear-headed. It’s great if you have a low tolerance or are new to edibles; just remember even two pieces can be filling. You won’t break the bank with this bar. So think less a “world of pure imagination” and more a “world of affordable sufficiency.” Or maybe just don’t think about that too much at all. 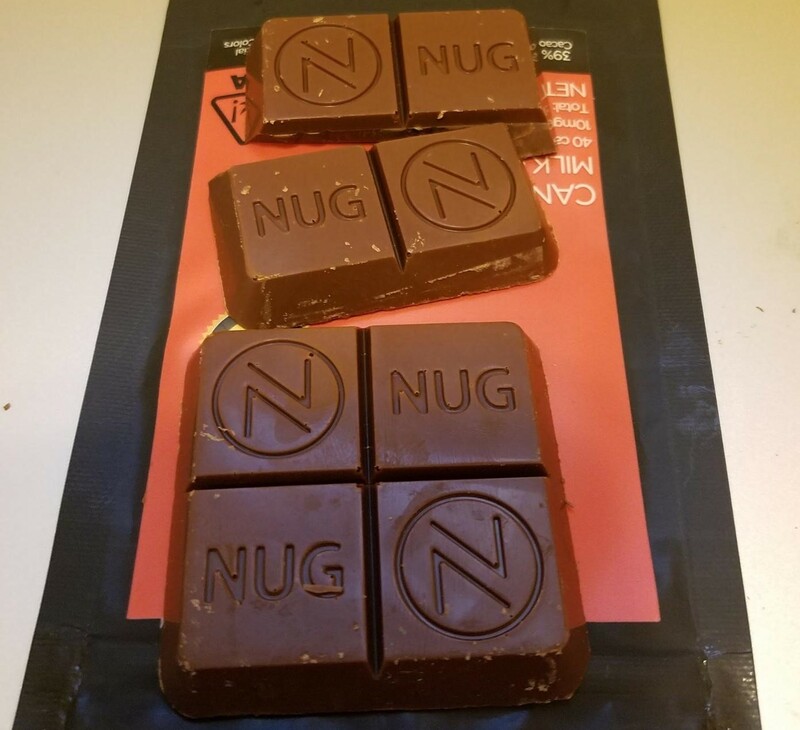 Stop by the Nugg Marketplace and search your local dispensary to see if NUG’s 80mg Milk Chocolate Bar is available for delivery if your area!